The past couple months I’ve carpooled into work every day with President Russell M. Nelson. We both work in downtown Salt Lake City, and I figured, “Hey, what better way to start off each day, than driving with the prophet for 35 minutes?” To be honest, he did most of the talking — okay, he did all of the talking. I guess, more accurately, I accepted a challenge to listen to all of President Nelson’s 75 general conference addresses from 1984 to 2018 in three months. So technically, our carpool was less of a conversation but conversely a consistent commuting conference communication challenge. That, my friend, is called alliteration. It’s one of the many things I picked up spending 17 hours with the poetic prose of our prophet coming through my AirPods. This was a fun and an inspiring experience. I learned a ton about this amazing man. It’s impossible to limit my learnings to only 10 observations, so I encourage you to take the challenge yourself for the full experience, but I’ll give you the Cliff-Notes version in reverse order, 10 through 1. 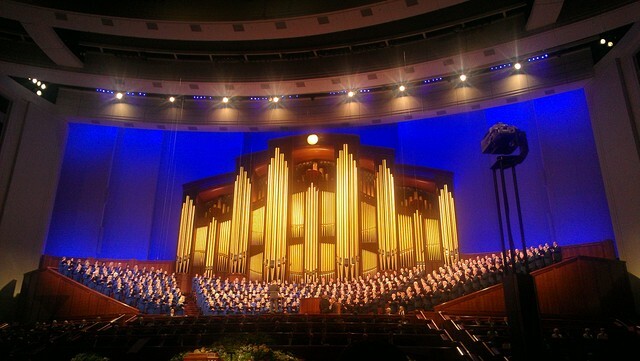 Twice, then-Elder Nelson has written a hymn that was sung by the Tabernacle Choir in general conference (once after his talk and once—in his 2003 address "Sweet Power of Prayer"— during his talk). In that instance, Elder Nelson, with eyes closed, ended the song at the pulpit simply: “in the name of Jesus Christ, amen.” He did this to personify the scripture, "the song of the righteous is a prayer unto me” (D&C 25:12). His hymn, “Our Prayer to Thee” was sung again in the most recent conference. President Nelson has perfect pitch and loves music, so it is no surprise that he requested the help of the choir to communicate his praise to the Lord. 9: Uses props at the pulpit. Growing up a member of The Church of Jesus Christ of Latter-day Saints, I was taught that we should not use props or object lessons in sacrament meeting addresses. I always assumed that counsel extended to general conference addresses, but I guess I was wrong. At the beginning of his 1997 address "Endure and Be Lifted Up," Elder Nelson uses a spool of thread, a card, tissue paper, and a pin to teach an object lesson. He blows into the spool for as long as he can without using his hands to show that the card sticks to the spool as long as he has breath. I have never seen anyone do anything like this in general conference. While the object lesson was cool, informative, and different, what this really taught me is that our culture may prevent us from doing certain things — and that culture sometimes needs to be challenged. 8: Knows how to receive revelation. In 2018, after becoming President of the Church, President Nelson gave a talk called “Revelation for the Church, Revelation for Our Lives,” where he teaches the steps necessary to receive revelation. I have studied this pattern many times attempting to learn the basics of a process the prophet has perfected. 7: Loves analyzing words and numbers. President Nelson frequently analyzes the meaning of important words — often using many languages to derive important findings. Here is an example from his 1996 address "The Atonement." As a fan of words, numbers, and analysis, I have always appreciated this approach to studying the gospel. There are adequate instances of impressive alliteration I observed throughout this educational experience. You may critique that last sentence as not appropriately alliterative because the words don’t begin with the same letter — but the definition of alliteration extends to sounds, not just the beginning letter. President Nelson uses it this way, and it can be pretty profound when principles are punctuated by such precise pronunciation. 5: Is uniquely prepared to do what he is doing. I believe it is no coincidence that the president of the Restored Church of Jesus Christ at this time is a heart surgeon. Russell Nelson is a pioneer. He made a name for himself by challenging the status quo, doing things differently, experimenting, and learning. President Nelson has been prepared throughout his life to enact change, and we are the beneficiaries of his training. 4: Is acquainted with death. Our prophet is well acquainted with life and with death. He even gave a talk devoted to the subject, called "Doors of Death." His profession as a cardiac surgeon has the consequence of lives saved and lives lost. Due to the many deaths President Nelson witnesses in his career, he was even invited to participate in a book on the topic of experiences beyond the veil (which he declined — not for lack of experience with the subject, but because it was too sacred to discuss). President Nelson has noted that he personally knew 10 of the 16 previous presidents of the Church — and has had the experience of losing them all (along with many other family and friends). In speaking of death, President Nelson often describes it as a generous gift from God. “Think of the alternative. If all 69 billion people who have ever lived on earth were still here, imagine the traffic jam! And we could own virtually nothing and scarcely make any responsible decisions. "Scriptures teach that death is essential to happiness: 'Now behold, it was not expedient that man should be reclaimed from this temporal death, for that would destroy the great plan of happiness.'" ► You'll also like: President Nelson's Hopeful Teachings About Death and the Nearness of Lost Loved Ones: "We Die to Live"
While I have recently focused on conference addresses from Russell M. Nelson, I’ve spent several years listening to talks from other general authorities and general officers of the Church. In that time, I have never known someone to speak as frequently about their family as President Nelson. His love for his family is clear, and his affection is obvious. From his parents to his late wife, Dantzel, to his wife, Wendy, to his children and grandchildren — all of them are spoken of highly, with love and admiration and respect. Ahem . . . not to brag, but I had perfect attendance throughout my four years of high school. I thought that was impressive consistency until I decided to listen to all of these general conference talks in succession. Not only did President Nelson not miss a single conference for any reason, but he is also the most consistent speaker in terms of length of address and topics. There are four “divinely appointed responsibilities of the Church," according to President Nelson: Helping to live the gospel of Jesus Christ, gather Israel through preaching the gospel, redeeming the dead through family history and temple work, and caring for the poor and needy. President Nelson has spoken about all of these topics and about nearly every other gospel topic throughout his 75 addresses. His talks are almost always exactly the same length (to the minute). As a fan of statistics, I wondered if this was the case for all speakers — I checked and it certainly is not. This consistency is a part of who he is. When President Nelson communicated a correction about the name of The Church of Jesus Christ of Latter-day Saints, it came as a surprise to many (including me) — but, in actuality, he spoke about this same issue in 1990 in an address called "Thus Shall My Church Be Called." My number one finding, after hearing 75 general conference addresses given over 34 years, is that this man personally knows and loves his Lord and Savior Jesus Christ. As I began this exercise, I wondered, “How many of these talks will specifically devote time to speaking about the Savior?” The answer is all of them. One hundred percent of the addresses President Nelson has written and delivered speak of the Savior and testify of Him. I’ve learned many things in the 17 hours I’ve spent with President Nelson’s voice streaming through my headphones as I battled traffic on my way to work each day. He is a great man. I’ve enjoyed “carpooling” with him and getting to know him better by studying his remarks over the past three decades. Of all of his many qualities and attributes, his best quality (in my opinion) is his love for the Savior Jesus Christ and his devotion to Him. Derek Westra is a husband to one, father to three, and self-proclaimed donut enthusiast to hundreds. Derek loves all things creative, including writing stories, painting (poorly), playing and recording music, and cooking (badly).